Asajj Ventress is the badass villian in the series. She is my favorite nightsister out of all of them. Let’s look at what this vicious character has to offer to your team. 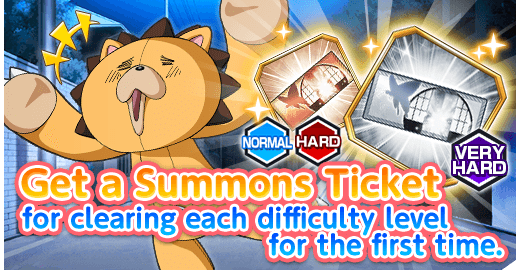 Basic Ability: Cruel Strike – Deal Physical damage to target enemy with a 35% chance to Stun for 1 turn. 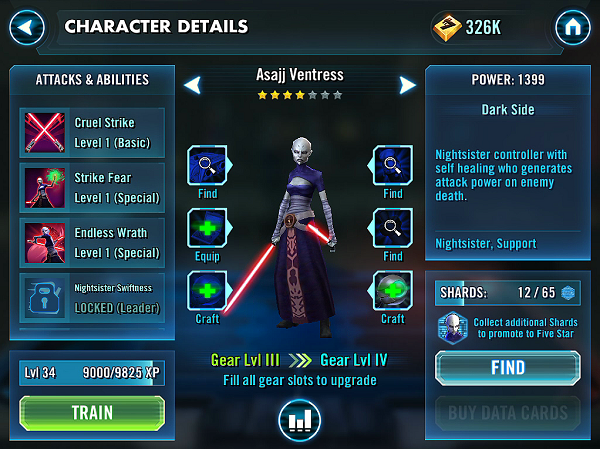 Unique Ability: Rampage – Whenever any ally or enemy is defeated, Asajj Ventress gains Offense Up and Defense Penetration for one action, with a 25% chance to also gain 32.5% Turn Meter. Leader Skill: Nightsister Swiftness – Nightsister allies gain 26 Speed and have a 25% chance to remove 10% Turn Meter when they damage an enemy. Asajj Ventress is great at disabling enemy buffs and self heal works wonders in the arena. Her greatest asset is the ability to disarm enemies, reset her own cooldown on killing blows and turn the tides in her favor. Her damage is decent and with 3 active skills + a unique, she is one of the few characters with 5 skills. She is best when teaming up with night sisters, with her as the leader. A recommended night sister team is Asajj(Leader), Luminara Unduli, Old Daka, Talia, Nightsister Initiate. Although her stun doesn’t have a high percent chance, 1 in 3 hits is good still decent. Combined with Old Daka, you will be able to stun enemies frequently, making it a deadly combo. The biggest downside is her speed. She is the SLOWEST character in the game if she is not a leader. If you like speed, then you are forced to use her as a leader and build a nighsister team. That isn’t a bad choice, but most new players won’t have the luxury to build a niche team early on. Verdict: Max Her if you want to run a night sister team. Although she is slow, this actually works out favorably for most turns. Her quicker teammates wear an opponent or two down to critical, and then Asajj finishes with them at the end of the turn with Endless Wrath – which automatically resets her cooldowns, and allows her to to use Endless Wrath again next turn. Although she is slow, this actually works out favorably for most turns. Her quicker teammates wear an opponent or two down to critical, and then Asajj finishes …with Endless Wrath. And if her speed was 380, she could wear the opponents down herself, maybe others on the team would also get in an attack or two, and then Ventress could pick the exact attack that would be best for Endless Wrath, use it & reset the cool downs. Or, if her speed was 3800, she could never reset her cool downs, but it wouldn’t matter because she’d have 10 actions between every 1 action anyone else took…and so she could burn a power, attack several times during the cool down, and before you even get your first turn after she burned her power, she gets to use it again. Sorry to be a downer, but being slow isn’t an advantage. If you were fast, you’d just go at the beginning of the sequence AND at the end…but you’d still go at the end of a series of attacks, even if you started that series. Saying that being slow is “favorable” is just silly. being slow is not as terrible as you might think, since at least she can use Endless Wrath with her first action after teammates have exposed a squishy, and not actually suffer the cool-down b/c of the fatal blow. But that doesn’t mean slow = good. Not even for Ventress. The Snowtrooper has a power-up after striking a finishing blow with the Snowtrooper AoE. So, think about it: if you would want to make the ST slower, you might convince me that you believe it’s favorable for certain characters to act last. Bottom line? It’s more favorable to act first…and then act quickly enough that there’s still a weak character around to take out with your second action. Value Ventress as you like, it still doesn’t make sense to say a slow speed is “favorable”. How to beat her ??? ?